LibAnswers allows you to create an online knowledge base of questions and answers that your patrons can access 24/7. These questions and answers are called FAQs. Within LibAnswers, FAQs are organized in one or more groups. Each group can then be further organized by topic and keyword, which allows your patrons to more easily browse and search for the most relevant FAQs. Groups can have different access levels, too, which means you can make some FAQs public and others private. That gives you the ability to use LibAnswers as an internal staff knowledge base, with FAQs that are only accessible to logged-in staff members. This can really come in handy for things like internal policies, passwords, ready reference resources, emergency procedures, etc. In addition, you can control which staff users can view, edit, and manage FAQs in each group. This can help you delegate the responsibility for maintaining each group to the appropriate departments or individuals. From scratch by going to Answers > Create and clicking on the FAQ tab. Tip: you can copy answers from other FAQs and tickets in your new FAQ. You can also link your new FAQ's answer to another FAQ. When the original is updated, those changes will be reflected automatically in every FAQ linked to it. This is useful if you want to add the same FAQ answer in multiple groups, or if you want different questions to display the same answer. When you copy an answer to a new FAQ, you will be able to make modifications to it in the new FAQ. However, keep in mind that if you link your new FAQ to another one, you will not be able to customize the answer in your new FAQ unless you unlink it (it will always display the answer exactly as it appears in the original FAQ). Admin users can create and edit FAQs in any group. However, Regular users can only create and edit FAQs in groups to which they've been given Admin or Editor user access. If a Regular user does not have access to any group, they will not see any options for adding FAQs in LibAnswers. When creating an FAQ, you can use the built-in rich text editor to add text, links, images, tables, lists, and other content to your answers. In addition, LibAnswers allows you to attach File, Link, and Media assets to each FAQ, as well. These will display after the answer text and can help you provide users with related information. To help you organize your FAQs, you can assign two types of metadata: Topics and Keywords. A Topic gives patrons a way to browse similar FAQs in a group. For example, in your Reference group, you may have topics like "Searching Databases", "Citing Sources", or "Genealogy". Users will be able to select a topic from your group's homepage to browse the FAQs assigned to it. A Keyword, on the other hand, is designed to help users when searching for FAQs. Each keyword you assign to an FAQ helps add weight to it in search results, while also appearing as facets on the search results page itself. Although topics also appear as facets and are used in relevancy ranking, keywords give you more overall flexibility in targeting key terms and phrases unique to each FAQ. For example, an FAQ about renewing books might benefit from keywords like "catalog", "account", "renewals", or "due date" -- things patrons might search for to find information about renewing books. New FAQs will start with a status of Unpublished Draft, meaning that it's not yet visible to the public in your FAQ group. Once you've finished creating your FAQ, you can update it's status to Published -- either immediately or scheduled on a future date. When an FAQ is published, it will be publicly available on your FAQ group's pages. Keep in mind, though, that who is allowed to view that FAQ depends upon the group's availability settings. The table below provides a summary of how an FAQ's visibility is affected by publication status and group availability. Who can search for it? Published Hidden Only people who have been given the group's URL; does not show up in general FAQ lists. Only on that group's search results page; it will not be included in general search results. Published Internal Only logged-in LibAnswers users; does not show up in general FAQ lists. Only logged-in LibAnswers users; does not show up in general search results. Published Restricted Internal Only logged-in users with Read-only, Editor, or Admin access to the group; does not show up in general FAQ lists. Only logged-in users with Read-only, Editor, or Admin access to the group; does not show up in general search results. Learn how to create a new FAQ and add or reuse an answer. You'll also learn how to add file, link, and media assets, as well as assign topic and keyword metadata. When finished, you'll learn how to publish your new FAQ or schedule it to be published on a future date. Learn how to create a new FAQ when replying to a ticket. The FAQ will contain the original patron question and use your reply as the answer text (though you can edit both before publishing it). Learn how to create a new FAQ using the question and answer of a Reference Analytics transaction. The Knowledge Base Explorer, found under Answers > FAQ Entries, is where you can browse, edit, and delete your FAQs. Admin users can manage all FAQs in your LibAnswers system, while Regular users can only manage the FAQs in the groups to which they were assigned Editor or Admin access. Filter the FAQs in your assigned groups by ID number; full text keywords; internal note keywords; publication status; group; creation date; owner; topic; and keyword. Browse FAQs by ID number, group, question, owner, creation date, last updated date, status, and total views. Preview an FAQ's public page. Quickly edit an FAQ's details, including its group, topics, keywords, and publication status. View the full Edit FAQ page, where you can edit an FAQ's question, details, answer, assets, topics, and keywords. It's also where you can view and manage an FAQ's comments and notes, as well. Learn how to navigate and manage your FAQs using the Knowledge Base Explorer. This includes options for editing and deleting FAQ entries. Learn how to edit the text of an FAQ's Question and Details fields. Learn how to edit the text of an FAQ's Answer field. Learn how to add, remove, and reorder Files, Links, and Media assets in an FAQ. Learn how to change an FAQ's group assignment, via both the Knowledge Base Explorer page and when editing an FAQ. Learn how to reassign ownership of an FAQ to another user in the group. Learn how to change or schedule a future change to an FAQ's publication status, via both the Knowledge Base Explorer page and when editing an FAQ. 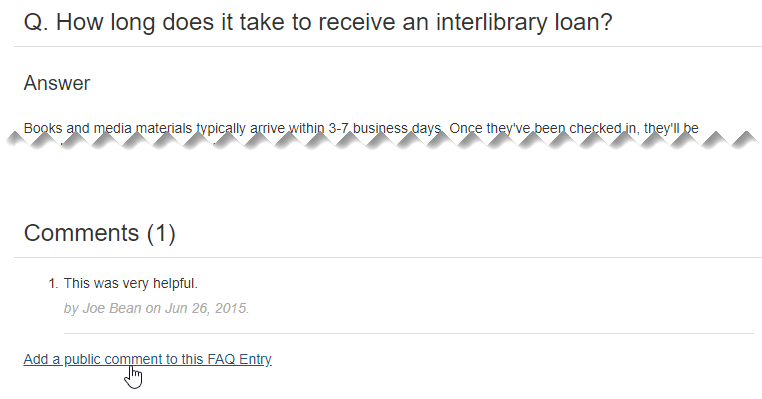 When viewing an FAQ, patrons will have the ability to leave public comments. Before a comment will appear under the FAQ's Comments section, however, it must first be approved by the FAQ's owner or another user with Editor or Admin access to the group. On the LibAnswers Dashboard, under the Pending Comments tab. This tab will indicate the number of pending comments in parentheses so you know when it needs reviewed. 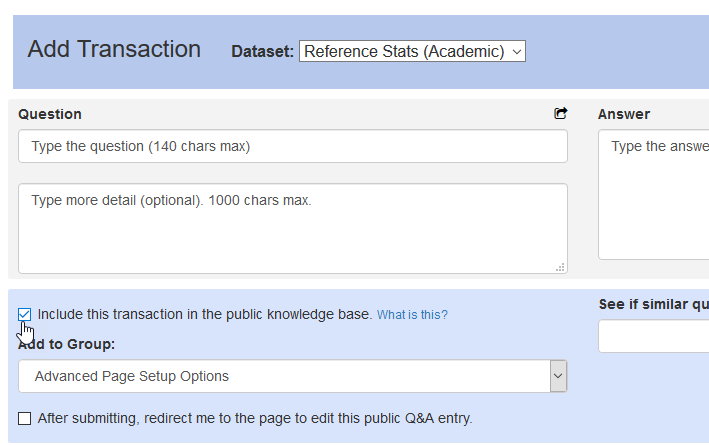 In the Knowledge Base Explorer by going to Answers > FAQ Entries and clicking on the Comments tab. When editing an FAQ, under the Comments tab. This tab will indicate the number of comments in parentheses. If you'd like, you can also add comments to an FAQ. This can be helpful if you want to leave a public response to another user's comments. You'll find this option when editing an FAQ, under the Comments tab. 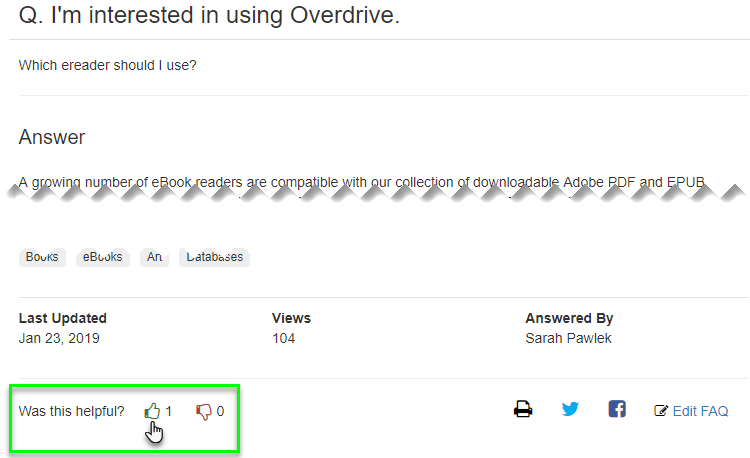 Another way patrons can leave feedback is by up-voting or down-voting an FAQ. Below each FAQ's answer, patrons will see a simple rating option labeled Was this helpful?, followed by a thumbs-up and thumbs-down option. Next to each option will be the current vote tallies, allowing users to see how other people have voted. They can then click on either option to cast their own thumbs-up or thumbs-down rating. Behind the scenes, you will be able to view the total number of up and down votes for each of your FAQs. The number of thumbs-down votes will be deducted from the total number of thumbs-up votes, giving you a net rating. Called the Overall Score, this can help you quickly identify FAQs that may benefit from revisions. You can choose to reset these vote tallies at any time -- either for individual FAQs, FAQs in a specific group, or for all FAQs in the system. 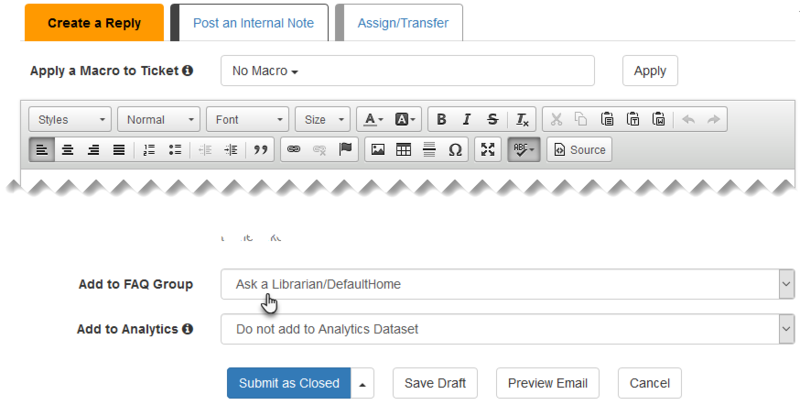 Learn how to manage FAQ comments via the Dashboard, via the Knowledge Base Explorer, and when editing an FAQ. Learn how to view and reset FAQ votes in the Knowledge Base Explorer. Learn how to hide the comments section on your published FAQ pages. This will prevent patrons from viewing any existing comments and adding new ones. Learn how to hide the voting options on your published FAQ pages. This will prevent patrons from seeing the "Was this helpful?" question and voting options. The number of FAQs added each month, broken down by group. This is found in the Total FAQ Public Views report, under Stats > FAQ Entries. The total number of public FAQ views each month, broken down by group. This is found in the Monthly Knoweldge Base Growth report, under Stats > FAQ Entries. The total number of public views for each FAQ, with an option to break these down by month. This is found in the Views column of the Knowledge Base Explorer, under Answers > FAQ Entries. 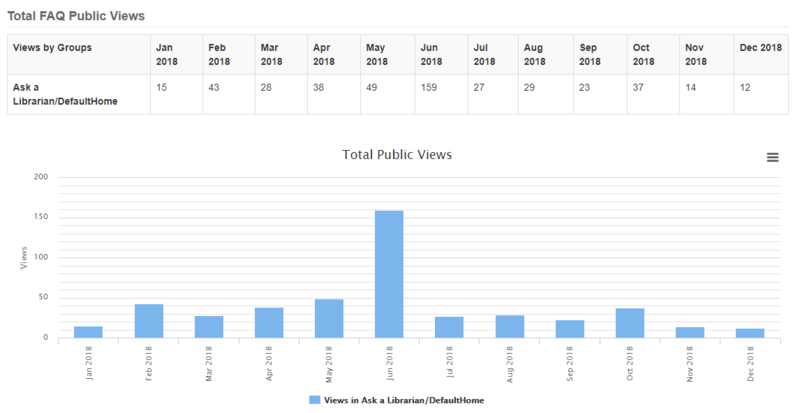 Breakdown of usage for each FAQ, including public page views; API views; shares on social media (using the buttons embedded on each public FAQ page); votes; and reuse by other LibAnswers sites (when using shared systems). These are found in the Statistics box when editing an FAQ. With the exception of of the usage breakdown for individual FAQs, you can export these stats to a CSV file for further analysis in Excel, Google Sheets, or another spreadsheet app. Learn how to view, filter, and export monthly FAQ view and knowledge base growth statistics, found under Stats > FAQ Entries. Learn how to view the number of views and shares for an individual FAQ. In addition to comments, votes, and statistics, you can also assess your FAQs by analyzing patron search queries. The Query Spy, found under Stats > Query Spy, allows you to review every search query submitted via your public pages or widgets for the past 6 months. The Queries tab provides a list of all search queries, each including the timestamp, user's IP address, query text, result, source, group, and referring URL. The Result indicates whether the user clicked on an FAQ (and which one), or if their query returned a direct match via the auto-suggest feature. You can also run the user's query yourself to get a sense of what results were returned (if any). The Statistics tab provides a breakdown of your search queries by result, as well as breakdowns by month, day of the week, and hour of the day. You'll even get a report of the top 25 most searched query words. Your queries and stats can both be filtered and exported. 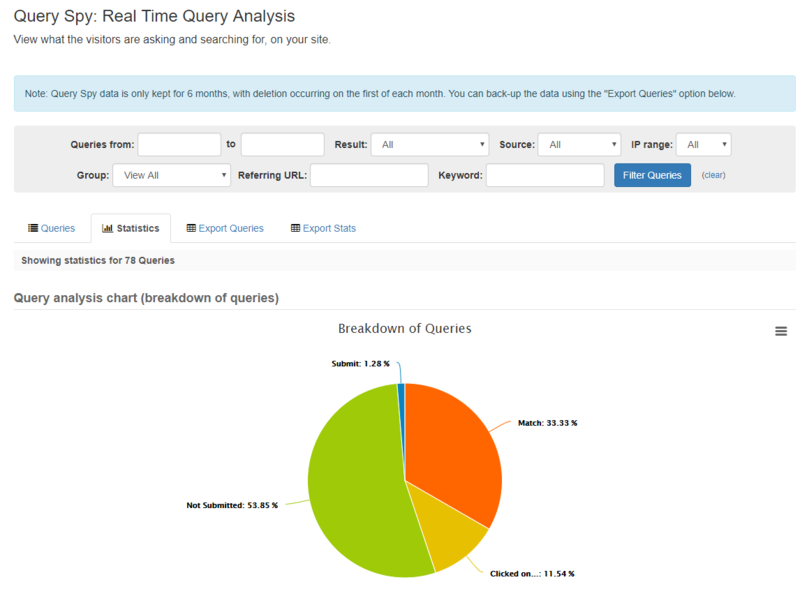 By regularly analyzing your Query Spy data, you can identify gaps in your knowledge base. For example, patrons may be searching for questions that you've not yet answered in your FAQs. Similarly, you can also identify how users are searching your FAQs, giving you insights into common search terms or phrases. This in turn can help you make your existing FAQs easier to find, whether its by adding keywords or rewording questions to better align with common queries. Learn how to use Query Spy to analyze the results of patron searches.